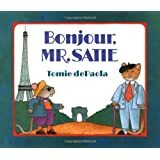 Bonjour, Mr. Satie (1991) by Tomie dePaola is the story of two children, Rosalie and Conrad, their uncle, Mr. Satie, and his “companion,” Ffortusque Ffollet, Esq. Enter your email address to follow RaiseThemRighteous and receive notifications of new posts by email. I am an interdisciplinary scholar and cultural theorist who researches children’s picture books. I’ve published in the Journal of Homosexuality, the edited collection Heroes, Heroines, and Everything in Between, and am currently working on a book length project under contract with the University Press of Mississippi. This blog and my Twitter account (@jlmiller516) are important aspects of my research. On the blog, I share reviews of every LGBTQ kid’s book I read to build a curated critical archive of LGBTQ children’s picture books. I use Twitter to connect with stakeholders, including publishers, authors, parents, educators, and librarians, many of whom provide valuable insights that directly impact my scholarship! Beyond LGBTQ kid lit, I review socially relevant children’s, middle-grade, and young adult literature that deals with race, class, gender, sexuality, immigration, and a variety of other issues that children need tools to think and talk about critically. I hope the blog does the work it’s intended to do – helps you curate a diverse and inclusive bookshelf! Contact me with suggestions for reviews at raisethemrighteous@gmail.com. I appreciate review copies, but like touching base to make sure content is appropriate for my blog! Daniel Vandever's "Fall in Line, Holden!"